Hello, Jane Austen, my old friend. Or, rather, Jane Austen as continued by Jane Odiwe. I'm not gonna beat around the bush here - I loved this book. Austen sequels are a dime a dozen and some of them are truly awful. But then, once in a blue moon, you come across an author who not only obviously adores Austen (to the point of distraction, and I'll get to that later), but one who respects the original work enough to emulate it and then proceed in the same vein. Willoughby's Return (2009), subtitled "A tale of almost irresistible temptation" is neither dry nor tawdry. This is no lifeless pile of words built upon Austen's frame, nor is it overly sexual; it remains comfortably in the appropriate time period. The story catches up with the Dashwood girls about three years after the events of Sense and Sensibility. Elinor and Edward have two young ones, Marianne and Brandon have a young son, and Margaret - never a diffident girl to begin with - has grown up and is ready to make her mark upon society. 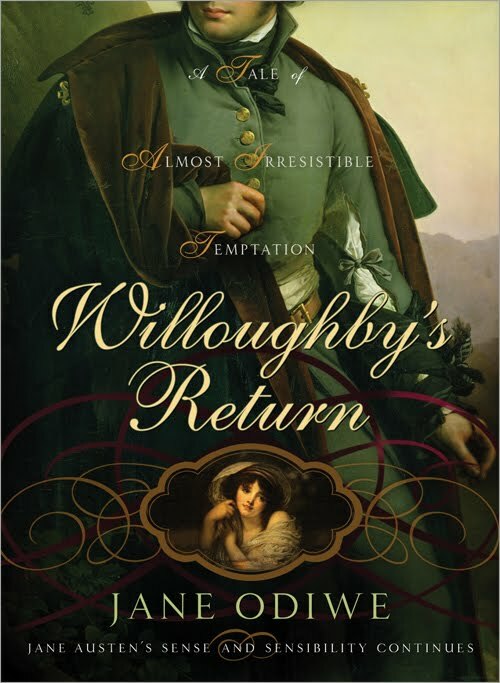 John Willoughby was of course the foul rogue and spoiler of women whose abandonment of Marianne's love in favor of wealth almost killed the poor girl. You would think these parties would never stand to be in one another's presence ever again. But when Willoughby is involved in some business with Brandon's nephew, fate seems to have a different plan. While Brandon runs off to Lyme to care for his ward and her sick daughter (that being Willoughby's daughter), Marianne finds herself confronted over and over again by Willoughby and his unabated passion. Meanwhile, Margaret confesses that she herself was once in love with Willoughby, falls in love with someone else, is seemingly rejected by someone else, and ends up resembling the Marianne Dashwood of old in every way. The story is well-constructed and the characters just as alive (if not more) as before. However (and here comes the point of distraction I was talking about) a large portion of the plot is drowning in pastiche. All of Austen's novels are represented, as if this book were the Austen Olympics. I wish that she had focused less on cramming in so many recognizable instances that had no place in the world of Sense and Sensibility. I, too, quite enjoyed this book, in the way it was written and how it ended. Have you read 'Charlotte Collins' by Jennifer Becton? It is my favorite Austen-esque book to date! Cheers! No, actually, I haven't. I'd heard of it, but hadn't actually committed to picking it up. I should do that!